Besides in the one good rogue deck. I want to see it good as a single card, not in some stupid combotastic win con. It is good as a single card, whenever Harrison Jones is unpopular. As for "stupid combotastic win con", that's what Rogue does best, whether you like it or not. Ideally, you use Deadly Poisons and/or Tinker's Sharpsword Oil on the Blade, smack the opponent in the face a couple times, then finish with a Blade Flurry, (plus whatever other damage you have available). If you don't like playing that way, Rogue may not be your cup o' tea. I suppose that's true. Gotta have some diversity amongst classes, after all, and I suppose Rogue is the combo class (for the most part). How many came here after checking Poisoned Blade? 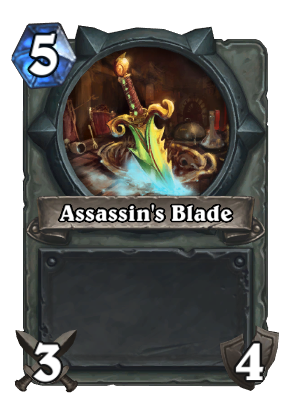 Assassin's Blade x 2 are a reward for raising a rogue to level 2. Golden Assassin's Blade is a reward for raising a rogue to levels 32 and 34.